“The sun’ll come out tomorrow,” is a famous line from the musical Annie. But every photographer knows that when you have a shoot scheduled, and it’s pouring rain, the sun needs to come out now! That’s exactly what happened as The Bahamian Project Crew pulled up to the Clifton Heritage site yesterday to shoot Bahamian writer, attorney and social activist, Marion Bethel. Duke Wells, known for his supernatural capacity to chase away raindrops, descended on the property with wife and fellow photographer Ana-Lisa Wells and the next thing we know, the sun is fighting her way back into the western Bahamian sky to add the much-needed natural light for the portrait session. The calm, pensive, smiling Marion Bethel showed up and appeared so much at home among Antonius Roberts’ carvings of slave women. 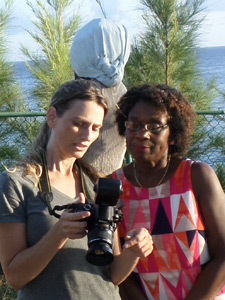 It’s Marion Bethel who birthed the film, “Womanish Ways,” relating Bahamian women’s struggle for the right to vote, with victory coming in 1962. It’s no wonder she felt right at home among rooted symbols of another cadre of women who had to fight for small freedoms when slavery in its largest context was yet to be abolished. All in all, it was a delightful time with an honour-worthy Bahamian possessing a delightful smile and a crew as excited about this shoot as if they were on their very first. Bahamians celebrating Bahamians and the beautiful country that houses our lives: that’s The Bahamian Project. Let our youth see our history. Roosie.